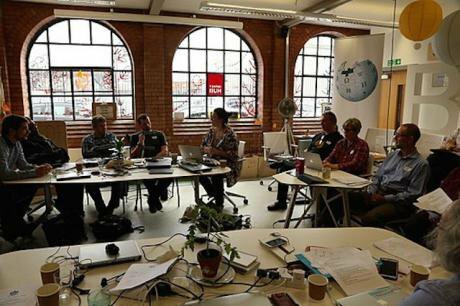 Wikimedia UK AGM 2016 at Impact Hub Birmingham, July 2016. Wikicommons/ Jwslubbock. Some rights reserved.In the forthcoming book, ‘Our City: Migrants and the Making of Modern Birmingham’, crowdfunded by Unbound, Jon Bloomfield has interviewed fifty migrants to Birmingham from all walks of life: a mix of first and second generation; men and women; from Ireland to India, Pakistan to Poland, the Caribbean to Somalia who talk frankly and with humour about their experiences both at work and in society more generally. In this first of four extracts, from the chapter on Migrants social mobility: the move to white-collar jobs, he delves into a small social enterprise company and the creation of the inter-cultural Impact Hub. Zubeda works in the burgeoning social enterprise sector. Her dad came with her grandfather from Gujarat in the early 1960s to work in the textile mills. There was a call out from the British government for the work that white British people did not want to do. He was fourteen at the time. Her dad married at a young age and then her mum came. They moved around in the North of England and then settled in Bolton. Zubeda was born in 1975, one of seven children and grew up in an Indian area, a mix of Hindus and Muslims with just three or four white kids in the primary school. Her secondary school was more mixed and she encountered a huge amount of racism there but she did her GCSEs, A levels and then went to Manchester University for her degree followed by a masters in Middle Eastern studies. Of the seven children, five went to university. She had to go to Manchester because she wasn’t allowed to stay away from home. Her parents were quite explicit on this. Fortunately, her older sister had gone before her. Then she came to Birmingham. She worked for the City Council in a number of different jobs on urban policy, in the Equalities Division, then was seconded to the West Midlands Police to help with the recruitment of community mentors where she created a regional mentoring programme. In 2013, she set up Connect Justice, a limited company and independent social enterprise designed to build trust between the police and ethnic minority communities. Zubeda emphasises that they are not a charity beholden to others, but rather an independent enterprise not reliant on grants. Over their first four years they have got the organisation off the ground with a voice and a presence in the extremism/radicalisation arena where they undertake a lot of their activity. She feels they have bridged the gap between minority communities and state agencies as they are not funded through the Home Office. Yet she retains her optimism. Zubeda’s organisation is based on justice and civil rights, not on ethnicity. Her co-director is a white convert to Islam; her third director is a hard-core secularist. They want to avoid the divisiveness that treats minorities as homogenous blocs and pits one community against another. She believes there has been too much focus on ethnicity, giving money to people because of who they are rather than what they do or the issues they are tackling. Connect Justice explicitly allies itself to the wider Birmingham community, which is why they are based at the Impact Hub social enterprise centre. 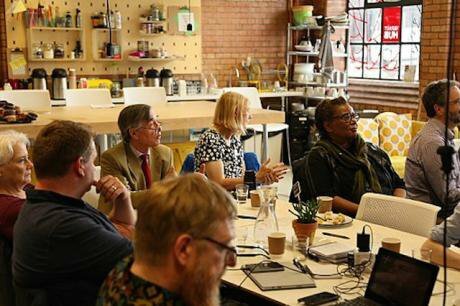 The Hub hosts micro-businesses and social enterprises and is growing fast with members from all backgrounds drawn from Birmingham and surrounding areas. It is the brainchild of Immy, a young, second generation Indian Sikh woman, born and bred in Birmingham, whose first main job was with the Tony Blair Faith Foundation in London. Immy is short and slim, wears a head-scarf and is full of energy. She was doing TEDX and she met people who told her to use the TEDX group to build something new. The Hub is based in the redbrick, renovated factory of a Victorian Birmingham manufacturer of marine instruments and is located close to the city centre in the old industrial quarter of Digbeth. This is the emerging creative nerve centre of the city. The Hub is just one of a string of venues that have taken root here over the last two decades including Maverick a burgeoning TV and media production company; Fazeley Studios with its 45 neatly designed offices aimed at creative and digital companies; and the Custard Factory – the former premises of Alfred Bird’s custard powder plant, now housing scores of micro-businesses and small NGOs. All these are clustered in Digbeth. The Hub is the conscious adaptation of an old industrial building to the needs of the new economy using European Structural Funds to promote social innovation and bring life to a dying quarter of the city. The onward march of automation poses a threat to a whole range of existing industrial and technical jobs. That’s why the renovation of places like this and the creation of new businesses and employment in growth sectors of the economy is crucial to the city’s future. With its strip lighting, high work benches, plywood tables and open plan workspace this is innovation easy style. Zubeda works here as does Sam and his health project team. He and others are grouped around the computer and worksheet discussing new projects. The white-board is littered with post-it notes. The extendable plug points drop from the ceiling so that the teams can connect to the ubiquitous portable computers that cover the tables. Relaxed, easy-going, youthful and inter-cultural: this is cosmopolitan hybridity, the open city at work and at ease with itself. It’s Birmingham’s answer to Shoreditch. The task is to replicate it across the city.